Photo taken at Laguna Seca Ranch in South Texas January 19, 2019. Nikon D850, Nikon 300mm f/2.8 lens, Nikon 1.4 TC, 1/2000 sec at f/8.0, ISO 400. 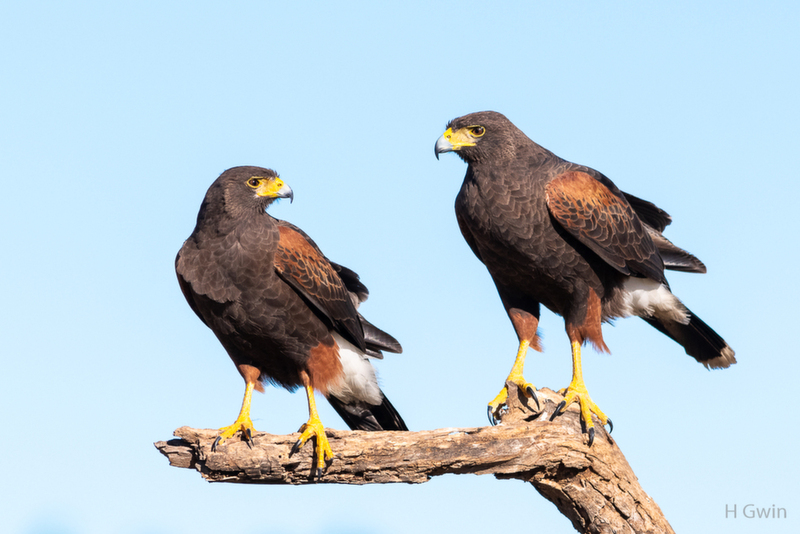 The Harris's Hawk on the right is bigger than the Harris's on the left. The larger Harris's on the right is the female. The male is visibly smaller than the female. Detail is better if you click on the image. Large and in charge - excellent image Gene. A handsome pair of hawks, Gene. The facing poses are excellent. Thanks for the information on gender size. She rules! . Striking image and illustration of the difference in the sexes. One of the most beautiful Raptor species, that is. Great image. This is a lovely shot. Great to see two of them together. Awesome shot - nice perch, great ”poses”, and such a clean bg.